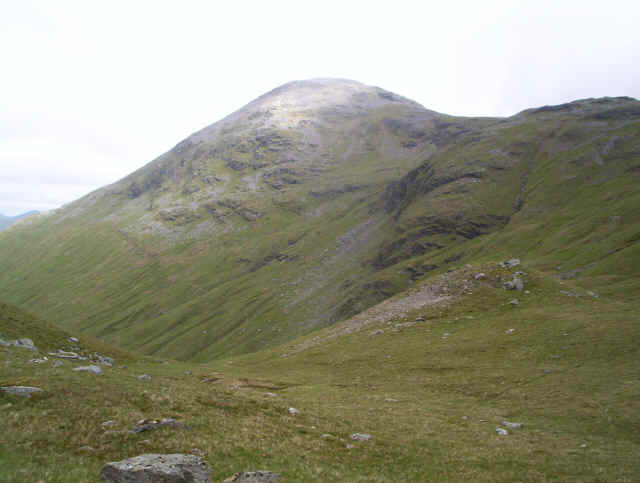 Ever since my first visit to the Tyndrum and Crianlarich area, I've wanted to climb these three hills. 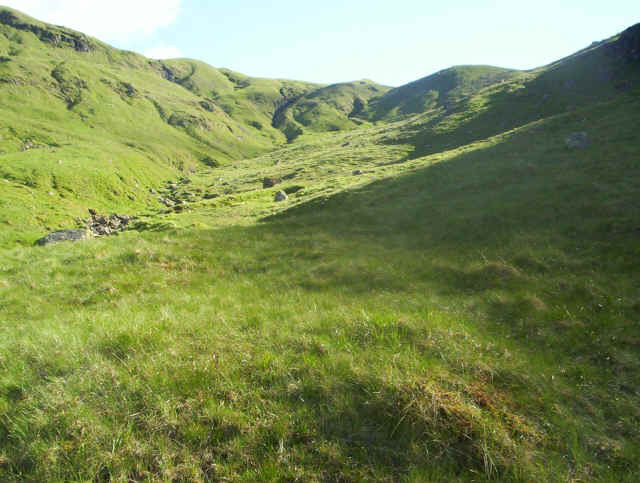 We once started on the climb to Ben Lui but were thwarted by the river Coninish being in spate. 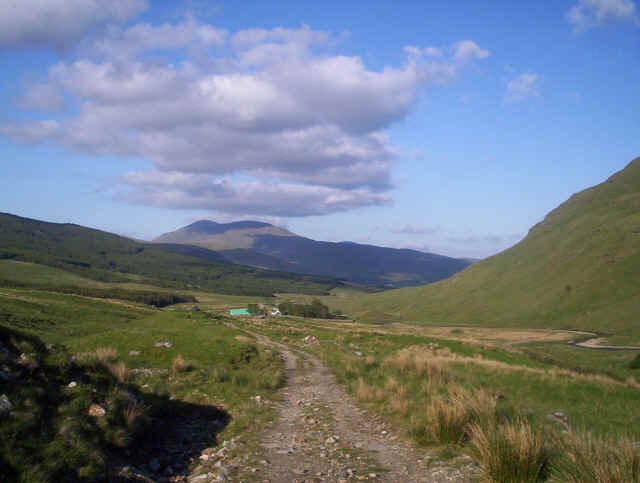 Anyway in June 2007 I set off from Tyndrum with the intention of climbing Bein Dubhcraig and Ben Oss. 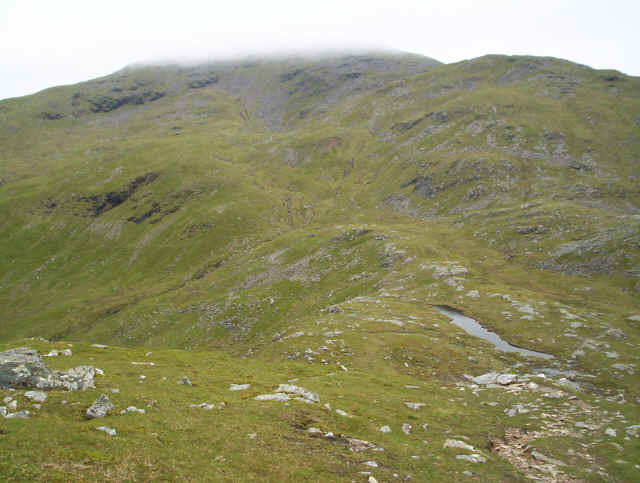 It became obvious that I had enough time in hand and it would also be possible to climb Ben Lui as well. In the end it was an eleven and a half hour day, but I wasn't in a hurry, and I was still back at the hotel in plenty of time for dinner. 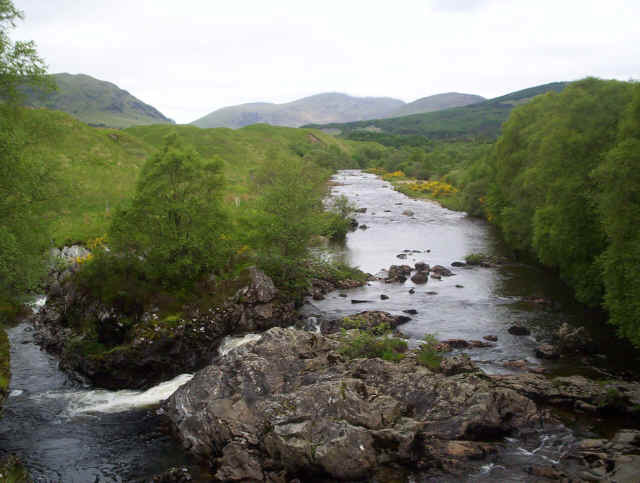 After walking along the West highland Way from Tyndrum I cross the River Cononish at Dalrigh. 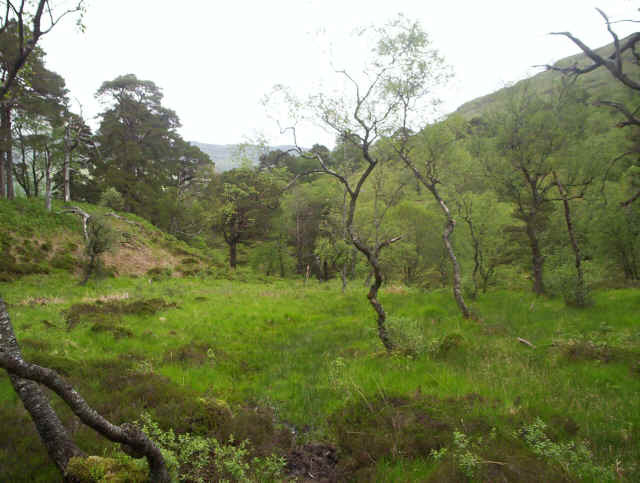 The way through the remnants of the Caledonian Forest is a bit boggy but nowhere near as horrendous as some writers suggest. 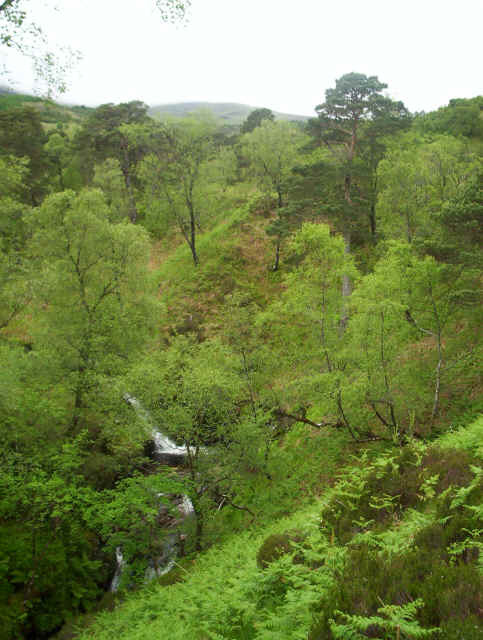 The track climbs above the Allt Coire Dubhcraig waterfalls. 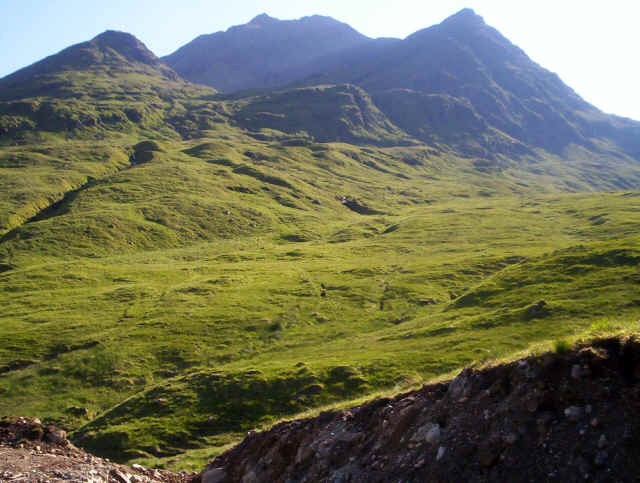 Looking back towards Strath Fillan. 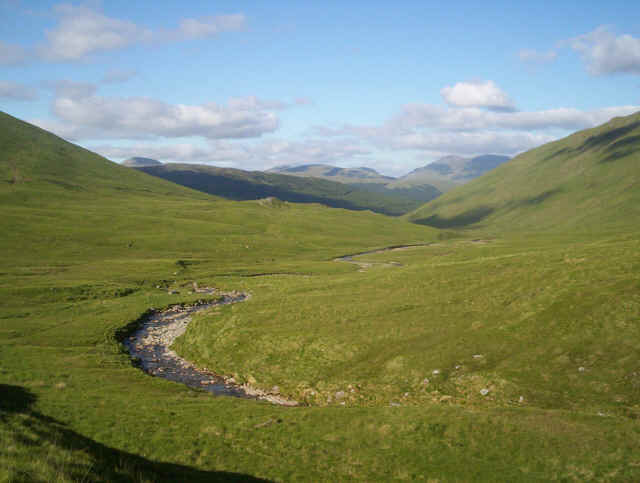 The River Cononish and the cloud covered slopes of Ben Lui. 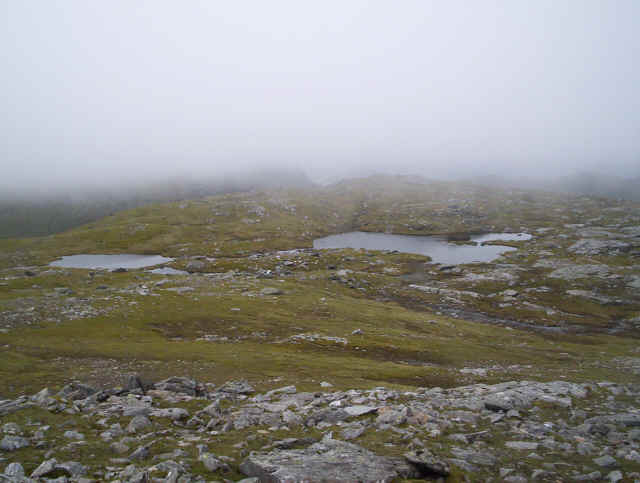 There's not much of a view from here on with low cloud, so it's compass and GPS navigation to the summit of Beinn Dubhcraig. The shelter at Beinn Dubhcraig's summit (978m) and time for a snack after a rather sweaty climb. 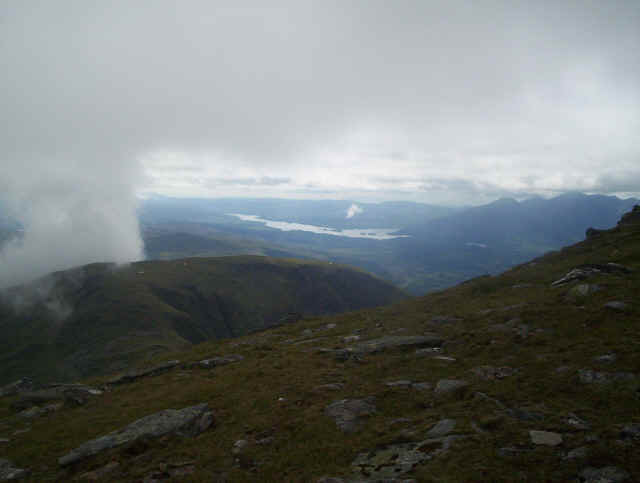 As I come down from the summit towards the lochans the cloud lifts a little. 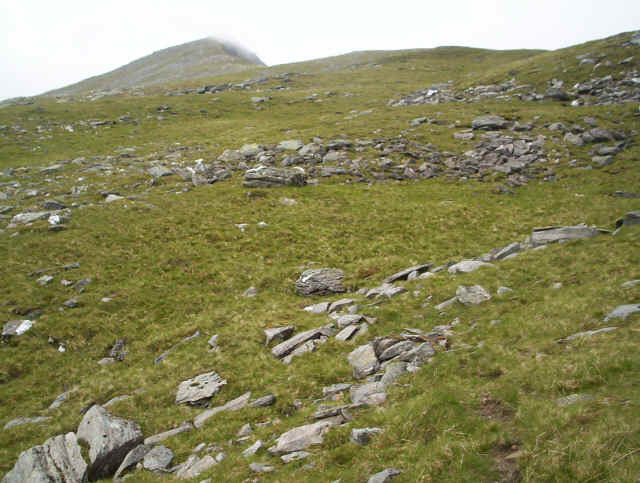 Going on to Ben Oss I need to drop down to Bealach Buidhe. Typically the clod base was going up and down all day. 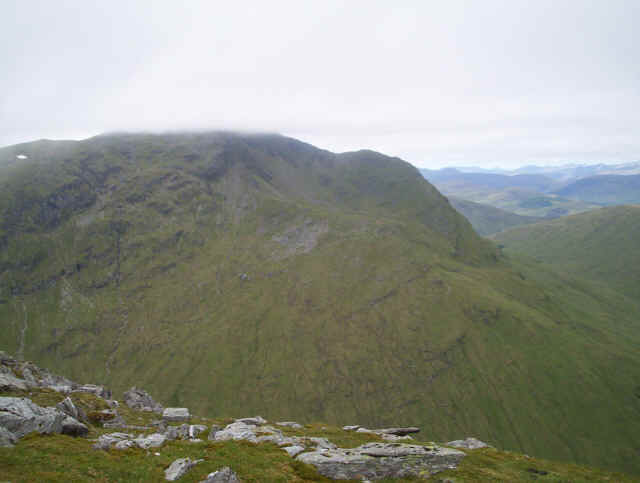 Here Beinn Dubchraig's summit is clear, half an hour after leaving it. 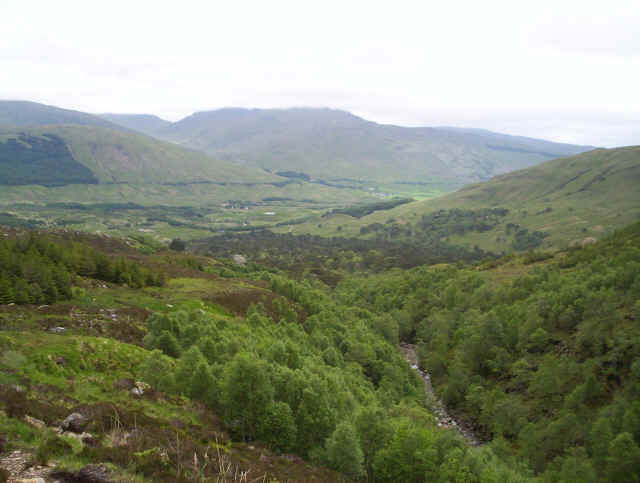 On the right is Loch Oss. 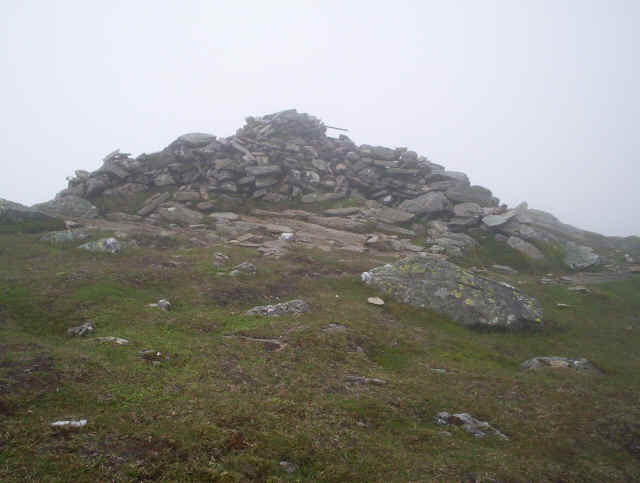 Sadly the cloud is still covering Ben Oss's summit (1029m) and I forget to take a photo of the cairn. 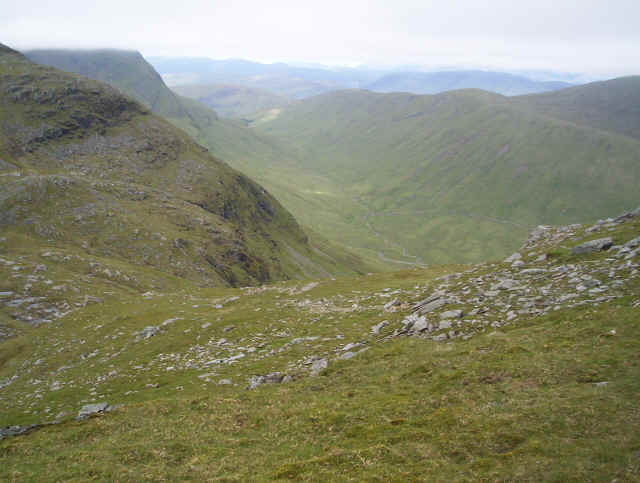 Coming down off the hill I'm heading for the bealach at the head of the Allt Coire Laoigh. 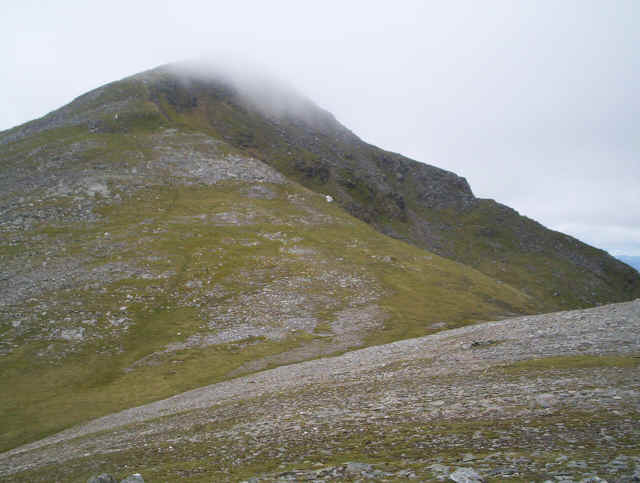 Ben Lui is almost clear of cloud so I decide it's worth climbing to the summit. 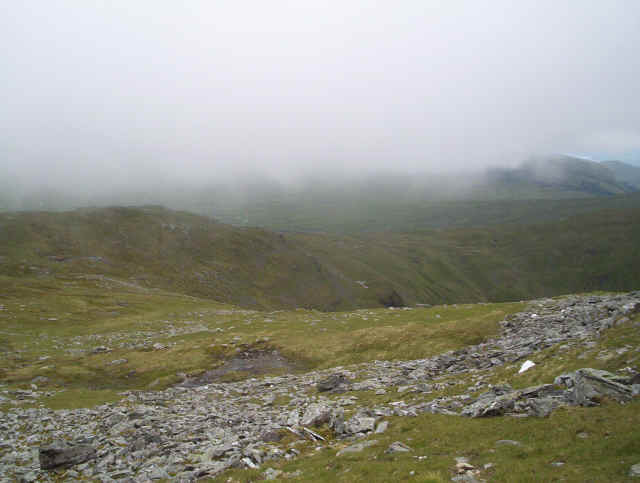 Typically, half an hour or so after leaving Benn Oss's summit the clouds clear and a patch of sunlight appears! 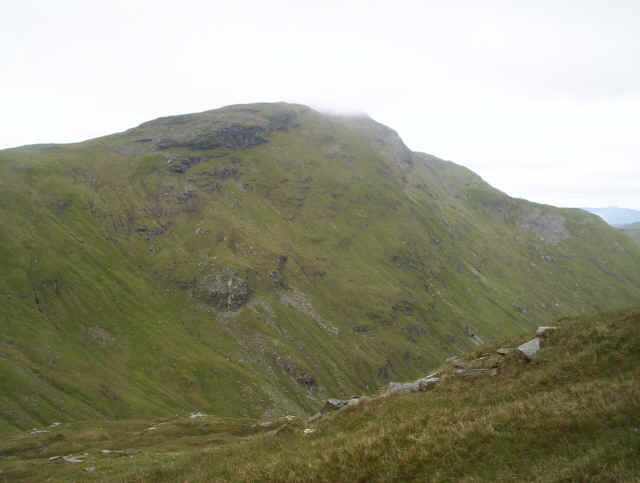 It's a long steady, but easy, climb up the south west shoulder of Ben Lui. 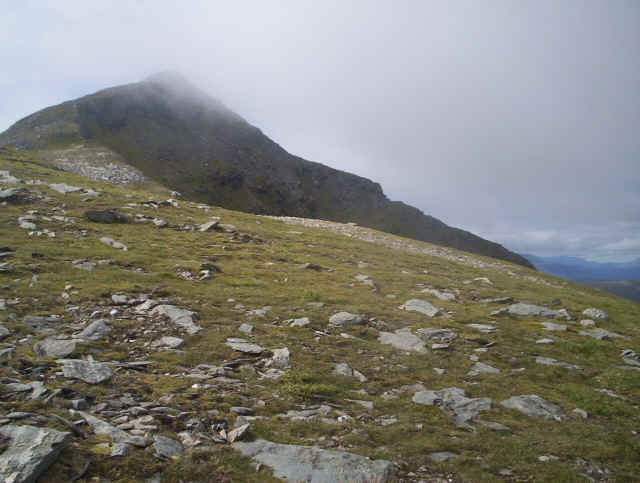 There's still an irritating patch of cloud hanging over the north west face of Ben Lui. 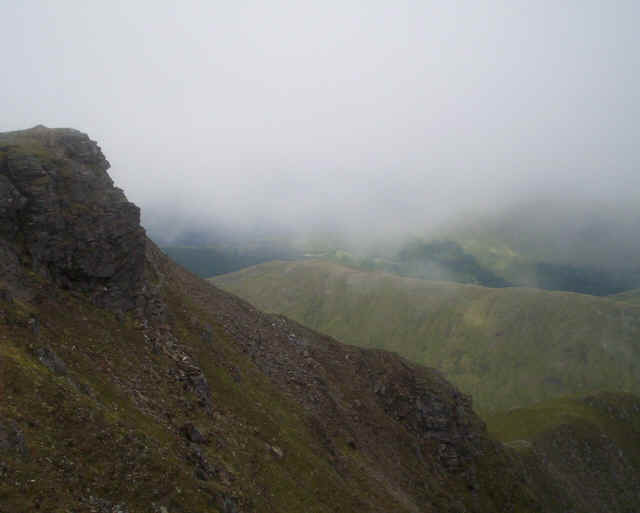 Looking down the east ridge of Ben Lui. 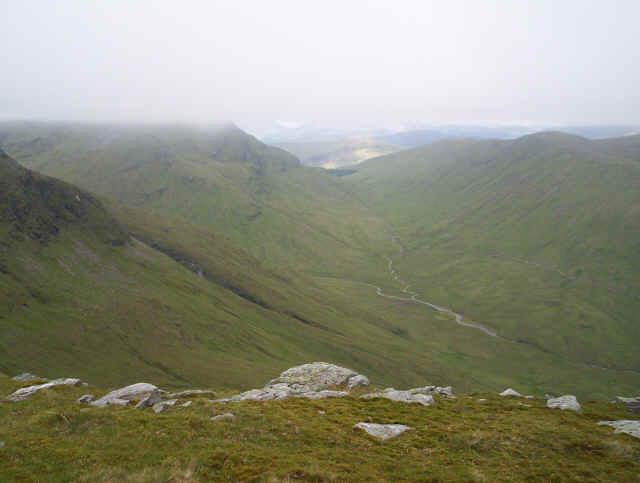 Heroes go down this way but I'm a coward, so it'll be back the way I came up to the bealach. The view to the west isn't bad. In the distance is Ben Cruachan and Loch Awe. 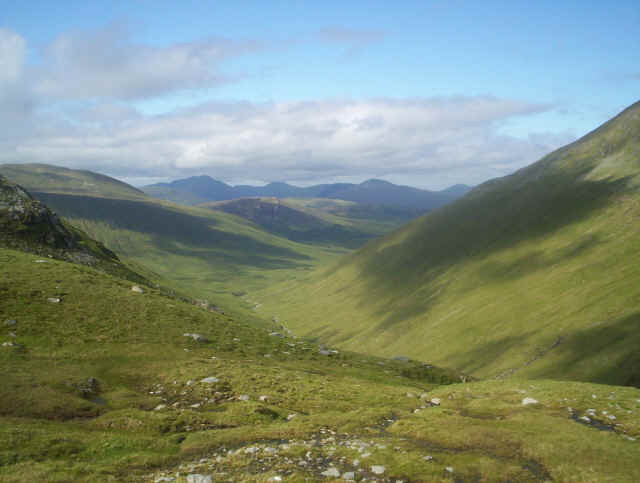 The hill in the foreground is another Munro, Beinn s'Chleibh and a lot lower than Ben Lui. 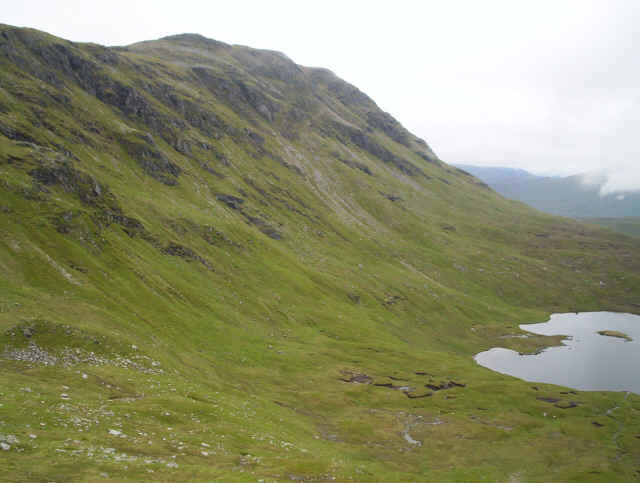 Lot's of walkers "bag" this hill by going down from Ben Lui, but time is running out if I want dinner. Besides it'll make a good walk on its own. Ah! there's the summit poking through the cloud. At first it's very steep down the head of the valley. Lower down the Allt Coire Laoigh the valley profile becomes gentler. There's an intermittent path down the valley. 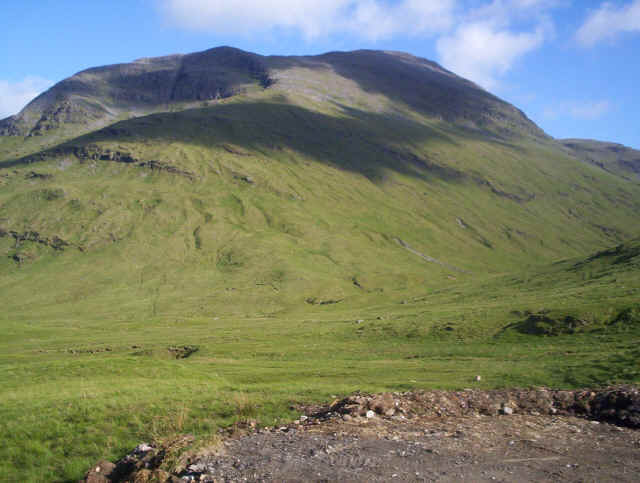 There's Ben Oss basking in the sunlight - the Coire Cruinn is a dominant feature. 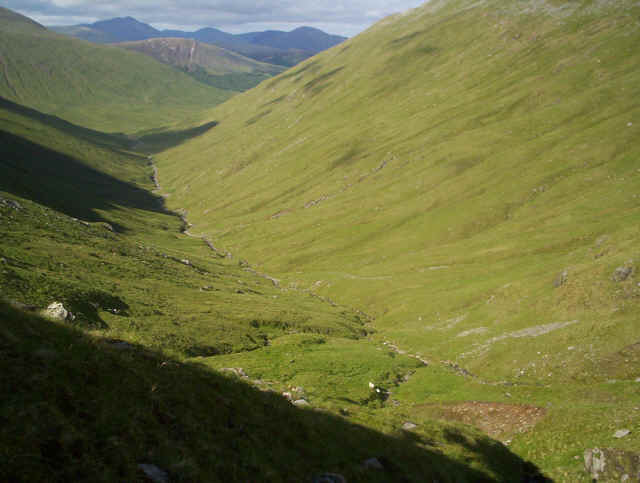 Ben Challum, above Tyndrum dominates the long walk back.